Along with our 2016 home renovation goals, there are some "smaller" house projects that I would like to tackle this year. One such project is our dining room. The room is so lackluster, and in need of some design pizzazz. The present state of our dining room can be described as boring and uninspiring... to me at least. My hubby probably thinks the room is fine. :) I have not given this space any design attention at all, which is evident. The holiday decor did liven up the room temporarily, but now that it is all put away, the dining area is back to blah. Okay, so the "bones" of the room are nice now that the great room has been renovated - hardwood floors, neutral canvas, and lots of natural light. However, the room needs some decorating love. 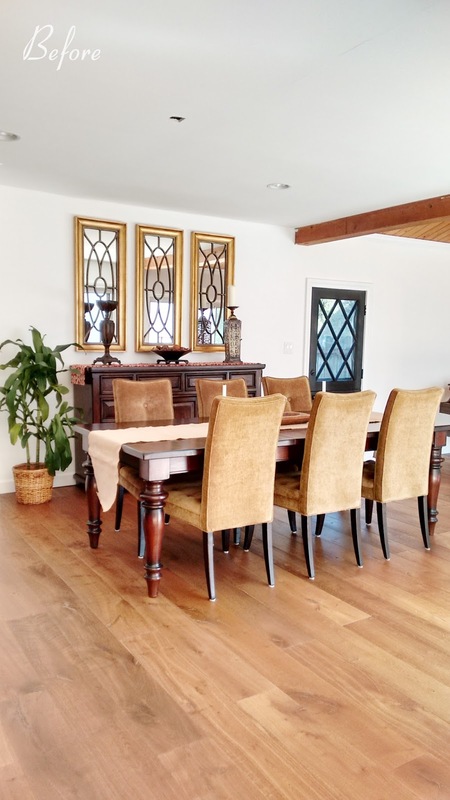 Since the kitchen, dining area, and family room all open to each other, I want the dining room decor to compliment (not compete with) the adjacent spaces yet have its own special "identity". Our home is not overflowing with space (code for smaller), but the floor plan is set-up where the common areas are "visually" connected. 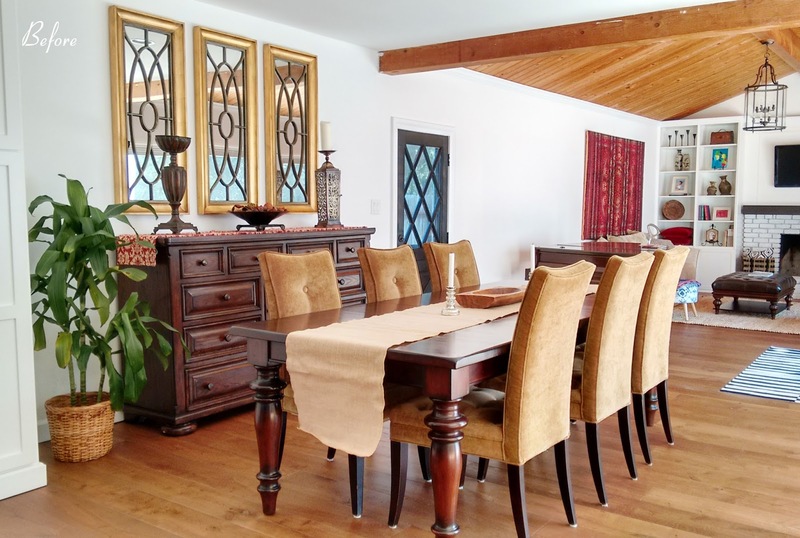 As such, the dining room is also visible from the living room and partially from the front entry. This makes me want to make this room even more special. The sliding doors will hopefully be replaced this year. We initially considered removing that wall between the kitchen and living room for a wide open layout, but I was concerned about sight lines. I'm glad we didn't remove the wall. We can conceal our kitchen messes better! 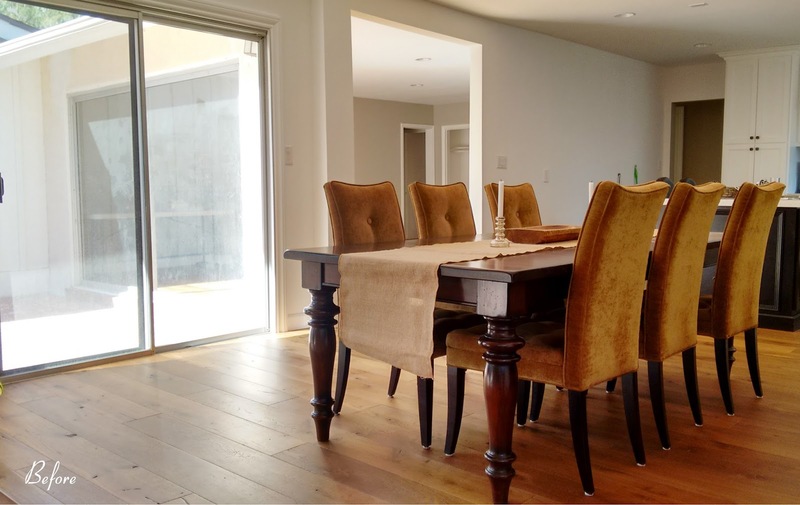 Right now, the space does have all the elements necessary to make it a dining room. You know, a table and chairs. We also put a sideboard in there, as well as our gold tryptic mirror set to fill out that wall. Although I haven't set a budget, this makeover will definitely be budget-friendly and far from extravagant. I will work with the existing furniture to save money upfront. The room isn't large, but it has a good starting point. My main objective in this room makeover is to add some character and design interest, while maintaining consistency with the adjacent spaces. CHANDELIER: Install a fixture above the table that complements the one in the family room. The chandelier will be a focal point. "HOST" CHAIRS: Add a set of "host" or "captain" chairs, preferably with arms, to bookend the table. ACCESSORIES/DECOR: Style the space with fun decor and accessories! AREA RUG?? : I go back and forth with this. I like how a rug (one that is appropriate for messes) would ground the dining area, but I'm not sure our particular space can accommodate the size I would prefer. CAD design tip: In dining rooms, the rug size should accommodate the table and all the chairs, including when the chairs are pulled out. I'm also thinking about doing a possible ceiling treatment in the dining room and kitchen, but that may be for another time?! 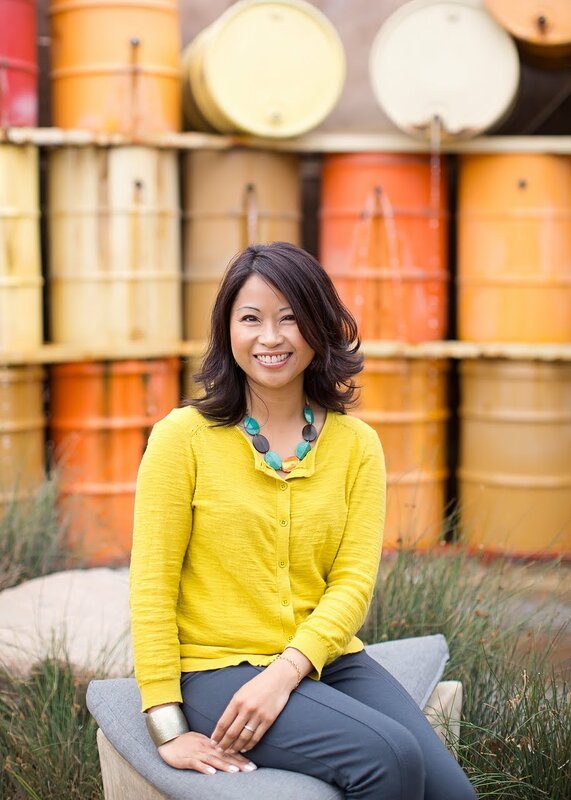 Follow me on Pinterest if you want to see the conceptual ideas I will be pinning for the room! You can see the archway and old ceiling "tiles" in these photos. 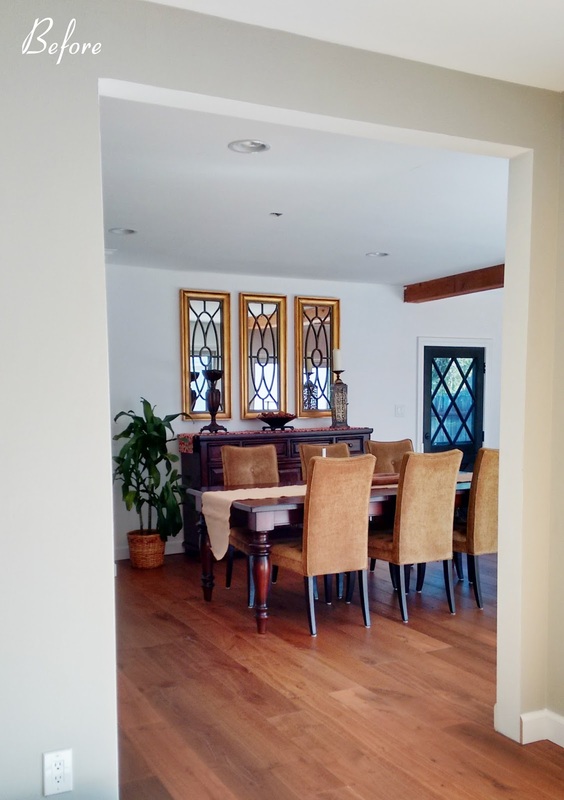 The initial renovation we did in just the dining area (pre move-in) included sheetrocking the ceiling, re-doing the archway, and adding recessed lighting. 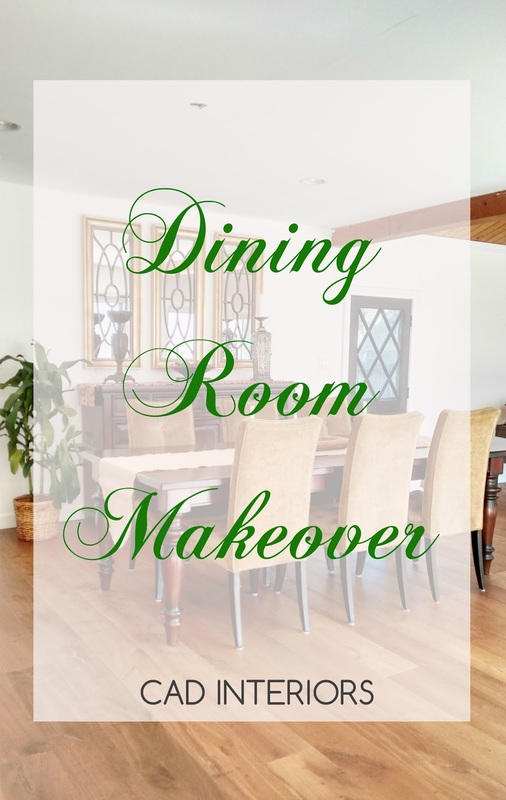 I guess you could say that we are now in round two of the dining room makeover! Living and dining rooms are the most important part of home, because it is space where the family members generally sit together and share their thoughts and emotions. They are also considered to be the right places to welcome close friends and relatives. Thus, one must never act negligently for its renovation and repairing, whenever required.